The Pitons are a signature St Lucia landmark, considered by some to be the “8th wonder of the world” and these Coconut Piton Brownies contain 8 ingredients providing baking wonder in every bite. Gluten and dairy free from the use of desiccated coconut and oil as opposed to flour and butter, these brownies pack a serious coconut and rum punch. The rum- optional but highly recommended, is St Lucia’s signature spirit and provides the brownies with an authentic Caribbean flavour. The liquor’s sweetness also pairs perfectly with the rich bitterness of the dark chocolate. To heighten the brownie’s central ingredient of coconut, coconut nectar and sugar can be used in place of the golden syrup and golden caster sugar. The inclusion of either the conventional or unconventional ingredients will herald the brownies with an extra fudgy taste and texture. Coconut sugar and nectar have a lower GI than golden syrup or golden caster sugar, but all four share a slight caramel flavour. 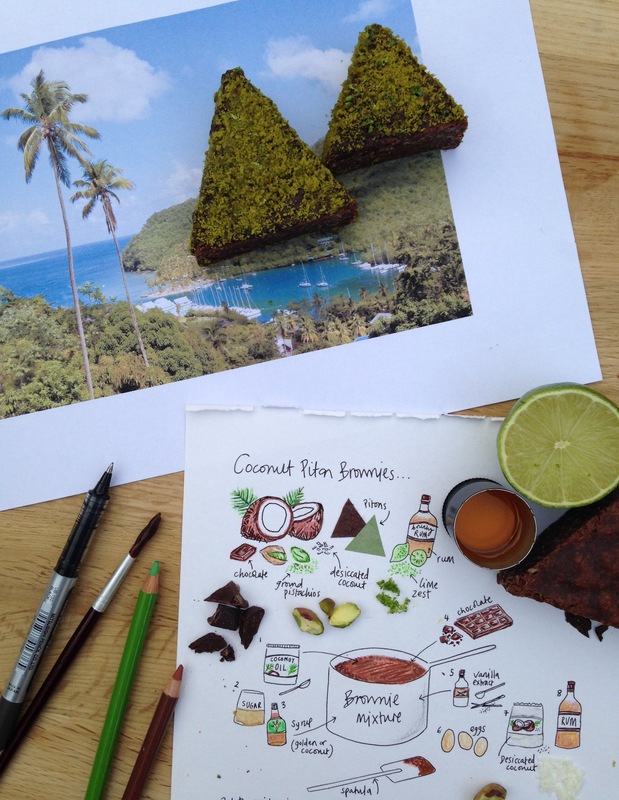 Cut into triangular Pitons rather than squares, both the shape and taste of these brownies highlight the Islands landmark inspiration and ingredients. Finally whether you present the brownies standing upright or not, covered in ground pistachios, zested lime or left plain, I challenge to you to not eat two pitons in one sitting, ideally with an extra glug of rum or cocoa tea for good measure. Put the coconut oil/butter, syrup and sugar into a saucepan. Set it over a medium heat and warm, stirring occasionally, until the oil has melted and the sugar has dissolved. Remove from the heat and add the chopped up chocolate and vanilla extract. Leave for a few minutes so the chocolate can soften and melt, and then stir the chocolaty mixture until smooth and combined. I find it helpful to use a silicone spatula to combine the mix and fold in all the sugary syrup from the base and side of the pan. Allow the pan and mixture to cool slightly. Use a hand-held electric whisk; beat the eggs into the warm chocolaty mixture in the pan until thick and velvety. Fold in the desiccated coconut gently but firmly until just combined. Finally stir through the rum if using. Pour into the prepared tin. Bake for 25-30 minutes or until the brownie has risen slightly and is firm to the touch; a skewer inserted into the centre should come out a little sticky. Leave to cool completely in the tin – the brownie will firm up as it cools. Transfer to the fridge to create a really fudgy brownie. Chilling the brownie will also make it easier to cut. Cut the brownie into triangular piton shapes using a ruler and sharp knife. If you’ve baked your brownies in a square tin cut the brownie into 3 x 6.5cm strips and then into triangles. The trimmings can be nibbled on or chopped into small soil like pieces to place in an around your pitons. If baked in a round tin, cut into slices and trim of the curved side to create a flat base for them to stand upright on. The trimmings can be treated in the same way as above and are also delicious scattered over coconut or rum and raisin ice-cream! 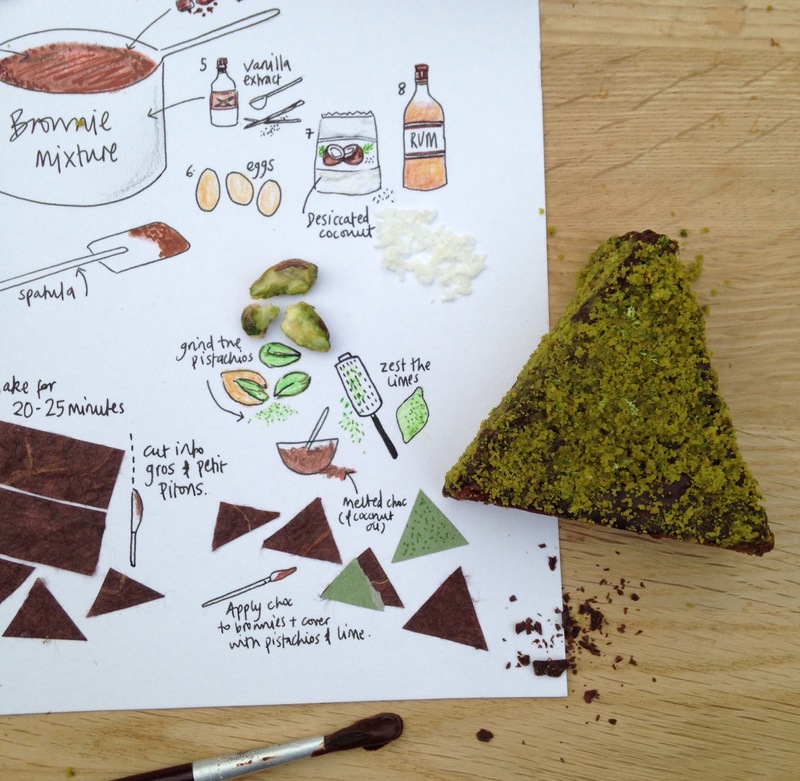 Finally, to create a lush green looking piton, cover the cut up brownies with extra melted chocolate using a paintbrush and scatter over some ground up pistachios. For an extra tropical taste and vibrancy, zest over some lime. Leave to set.